Libraries are facing cuts, and are closing at an alarming rate all over the country – CILIP (Chartered Institute of Librarians and Information Professionals) estimates that 600 libraries, mobile libraries and services could be destroyed in the next few years. As a former Library Assistant (totally different to a Librarian, but more of that later) I have seen first hand how people rely on these hubs of community and their books. But the world is moving fast. Books are cheap. Do libraries still have a place in the society of the future? Most people see a library as like some kind of book shop – like Blockbuster, but with novels instead of DVDs. They might have popped in to use a computer if theirs was broken or they needed to study in peace, and they might even have borrowed a CD or taken their children to story time. I think they are missing the point, but I don’t think libraries are helping their own image. What is the actual essence of a library? It’s not necessarily the books, or the building. It’s a more abstract concept – that of a community of learning. 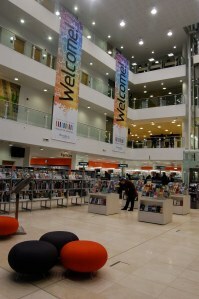 There are moves now to introduce more events and variety into the day to day lives of libraries – Newcastle Central Library is a good example of this; There are story times, book groups, study space and exhibitions, but I still don’t think they are going far enough. Libraries should be alive with learning. They should be a destination, a democratic meeting place. Lectures open to the public with teachers and librarians on hand to help with research. There was a time when every public library had to have at least one qualified librarian – a graduate who has studied for a highly specialised qualification. A librarian can not only answer any question, but they can show you the reputable sources and guide you to further reading. They can navigate the world of information and pick out the important bits, and they can keep that information safe for when it’s needed. In this age of information, Librarians should be our guides, instead they are losing their jobs. I propose that we bring back this emphasis on the skills of the librarian, and allow them to work with teachers, lecturers, artists and other specialists to create an environment that will remain a vital part of our educational armoury. Home Education is becoming more and more widespread, with current conservative estimates at 40,000 school age children, and rising. More people are choosing to study university and college courses on a part time or distance learning basis, with most universities offering part time and distance options, as well as dedicated institutions like the Open University and ICS. Many people now can’t afford the qualifications that they need or want, and there is a growing group of adults with poor literacy and numeracy. The world is getting more and more complex, yet mass entertainment is becoming simpler. If we do learn informally, it is often through Wikipedia, or reading biased newspapers. People are getting lonely and more and more segregated by age, class and social group, which is leading to tensions, blame and prejudice. We need to bring our libraries back to the centre of our communities. Let’s see informal and formal discussions, activities and resources, all together with books, computers even things as simple as paper, pens and quiet tables. 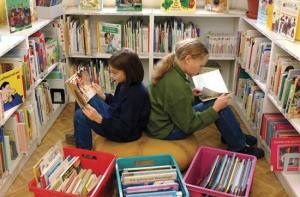 Small libraries could be quieter, with only a few events, and larger ones should be full of opportunity and excitement. I want to be able to bring a toddler to story time, an older child to a science lesson and a teenager to a philosophy group. I want political meetings, inclusive discussions and exciting lectures. I want to be able to buy stationary and a coffee and read the papers. I want poetry readings, comedy nights and art exhibitions. I want books, lots of them, but also guidance on the internet, more information on television shows, discussions after plays, talks about local history. I want us to hold on for dear life to the principle that there should be a library, free and open to all, in every community, for everyone. It might have to adapt, but it needs to exist. Think Left : Julian Gilbert and Katie Mace. This entry was posted in Education and tagged communities, Education, libraries by adminthinkleft. Bookmark the permalink.